My kids absolutely love jumping in the bath and splashing away. Think unabashed dolphins meet a very small body of water and you’ve got the picture. Although bath time is typically a dynamic and gleeful experience, there are times where it just isn’t. There have been a number of factors we can attribute to them just not wanting in. For instance, once a hanging shower caddy fell into the bath and scared the living daylights out of my then two-year-old daughter. She was distraught for numerous bathtimes to come. Other times, the crying or general lack of desire to get in the bath have been less clear. In those moments, I’ve resorted to coming up with quick bath time activities. Below is a wonderful list of fun bath time activities for a tear free bath. To make our bath paint, all we do is take plastic cups, shaving cream (the less scented, the better – I’m not a fan of my kids smelling like cologne), food colouring, and paint brushes. Put shaving cream into cups. Then, combine colours. Et voila! Bath paints. I ask the kids not to paint the grout but treat each tile as a page of paper. Or, you can instruct them to just paint the tub and bath toys too. Sometimes the paint can be a struggle to get out of it. Paint away and have a BLAST! Try Neon Bath Paint. Find out where to purchase it and how it works here. Want something SUPER easy instead? Put a couple of drops of food colouring into the tub. Sometimes that’s all it takes to have their imaginations come to life and for bathtime to be tear-free. 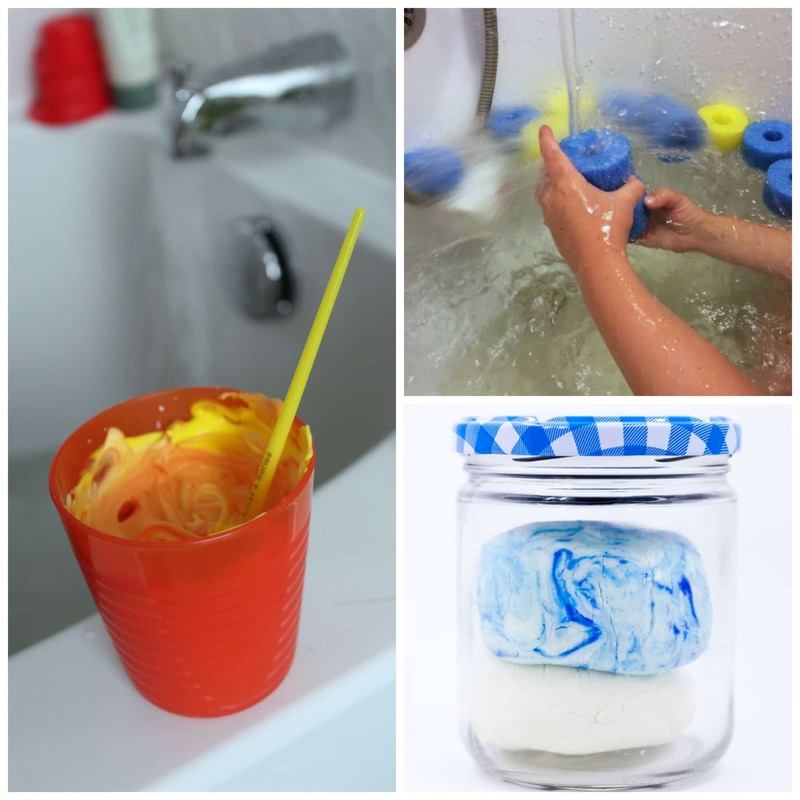 Make bath crayons with glycerine soap. Find the instructions here. Of the bath time activities, this is the one that has me the most excited. Grab some cornstarch, natural bubble bath, and colour! Follow these instructions and you have bathtime playdough. It really is as amazing as it sounds! To create DIY snow, all you need is baking soda and these instructions. Or, try freezing letters or small figures in ice and have your children try to excavate them. Cut up pool noodles, cut out foam shapes, and have fun! Create a thematic bath with some of these ideas. There are so many fun bath time activities here. They are sure to decrease tears and increase enjoyment during bath-time.